While having a beautiful website with a unique logo and easy-to-use interface is important, there’s a lot more to a great site than just a pretty face. You need to be able to drive more traffic to your site and accommodate all the new people being exposed to your business. Also known as SEO marketing, search engine optimization is an online marketing tool designed to drive more traffic to your website by achieving a higher organic ranking on search engines such as Google and Bing. After reaching the highest ranking your website can achieve, the link will be featured directly under the “featured” ads that are often found on search engines, enabling more people to understand what your company does and become interested in doing business with you. SEO marketing means nothing if your domain name is difficult to remember. While the name of your website can technically be up to 67 characters long, the most successful domain names tend to be 20 characters or less. A great web development company knows this, and can work around existing domain names that are similar to the one you’re looking for and develop one that people will instantly associate with your company. Once you get all these new potential customers to your website, it’s important to be well-equipped to handle the extra web hosting requirements. You typically want to aim for about 20% more space in web hosting than you need at first to leave room for your website to expand. Your team of web development pros will both account for this future growth as well as perform regular maintenance to your website to ensure it is working properly at all times. It’s important not to overlook the odds and ends of digital marketing when you decide to build a better website. 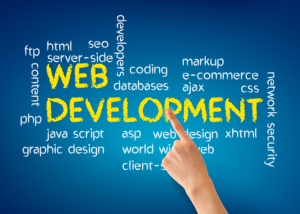 By enlisting the help of a great web development company, you will leave no stone unturned, and you’ll notice an immediate increase in traffic to your website.